From Beijing I took an express train to Xian. I had a soft-sleeper ticket, it was comfortable but expensive. As soon as I arrived in Xian I booked the onward ticket, because this time of year tickets are not that easy to get (there is a big holiday around the corer - the first of May - and a lot of people take their vacation now). 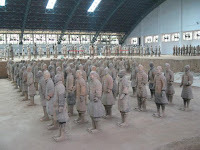 After I checked in a hostel I went to see the famous Army of Terracotta Warriors. I followed my guide book recommendation and visited the sites in the descending order (pit 3, 2, 1 - from smaller to the bigger). It is an interesting place. I knew about this place for quite a while - I've seen it on TV, along with the history. I was expecting to be a bit more colourful. 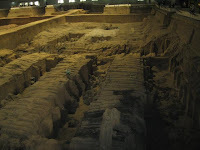 The entrance fee is a big too expensive, if I compare this site with the Great Wall. 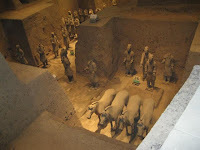 I guess I was lucky to see tens of warriors that have been excavated and being displayed a bit closer - I understood that in a month or so there will be put in their original position, down in the pit. 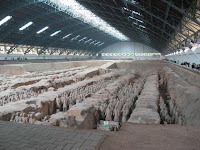 So far there are about 2000 warriors excavated from an estimated number of 6000. Therefore, it will only get better as the time will go on. Do you know that you could have seen some warriors in France too? Well, nearly three month of travelling...I hope you still enjoy you're travel around the word. I can see great pictures and i hope you don't feel lonely in all that new places...But as I notice you're still eating icecream ... it's a sign that you're in a good moon! What are the next countries? Yes, I still enjoy it, and I don't have time to get lonely. I assume the next will be either Laos or Vietnam.